Want to know if your device is USB OTG compatible? Discover it by downloading our application! You do not have to wait for long minutes, the result is immediate. Do not expect to have tons of useless features, there's only what you're looking for. We do not ask for access to your GPS or your contacts just to see if you are USB OTG compatible. 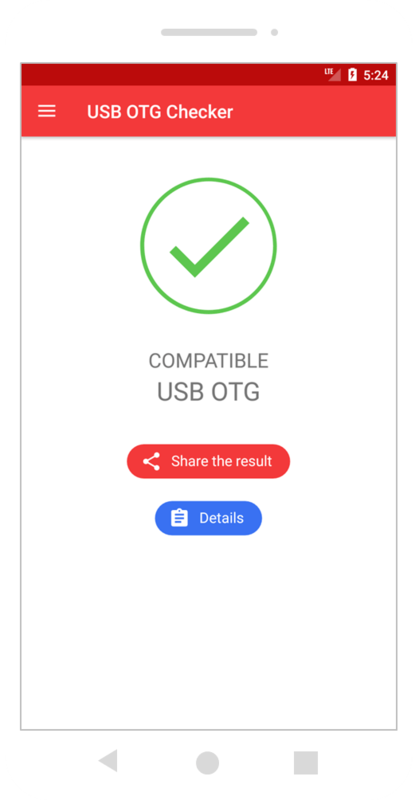 USB OTG Checker is a tool to check whether your device is compatible with USB OTG technology, OTG stands for "On The Go" and allows you to connect USB devices directly to your mobile device. using an adapter. USB OTG Checker only checks if Android has the necessary modules to run OTG by validating all steps to access a connected device. You want to be informed of our updates and new applications as soon as they are released? Test your device for free!